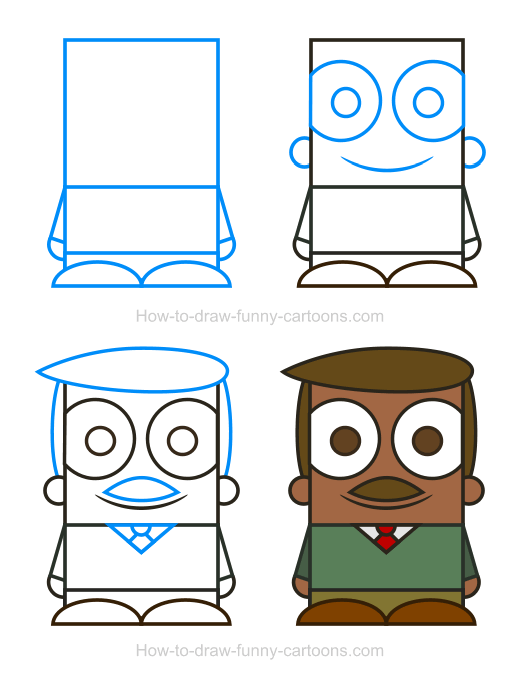 What better lesson than one based on a teacher clipart to learn to draw fun and amusing cartoon illustrations! 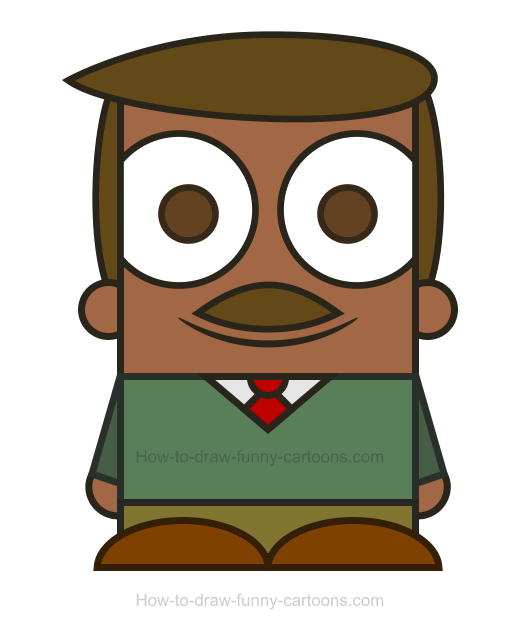 Using basic shapes and colors, you will have the chance to create a colorful teacher wearing a simple shirt, green pants and a big lovely moustache! Teachers are an important part of every children's life. Good teachers can be inspiring, motivating and filled with valuable knowledge. They can also help students enjoy class and go one step further in life. Do you remember a good teacher that had a huge impact in your life? I'm sure you do! Let's draw one that is adorable and easy to duplicate. 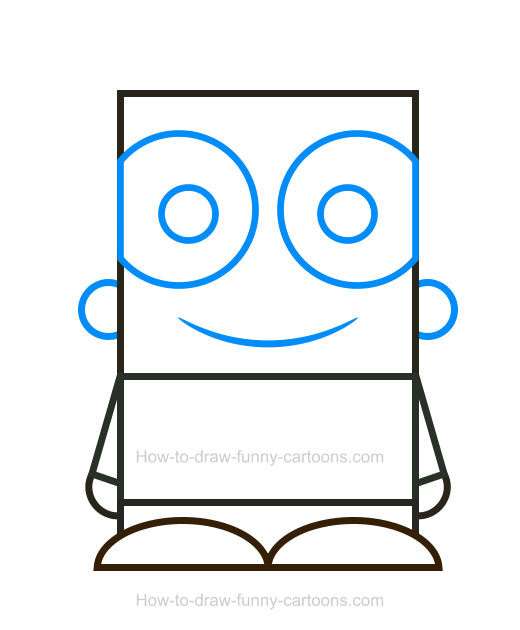 Let's begin this lesson by sketching a large rectangle to create the head of this cartoon teacher. 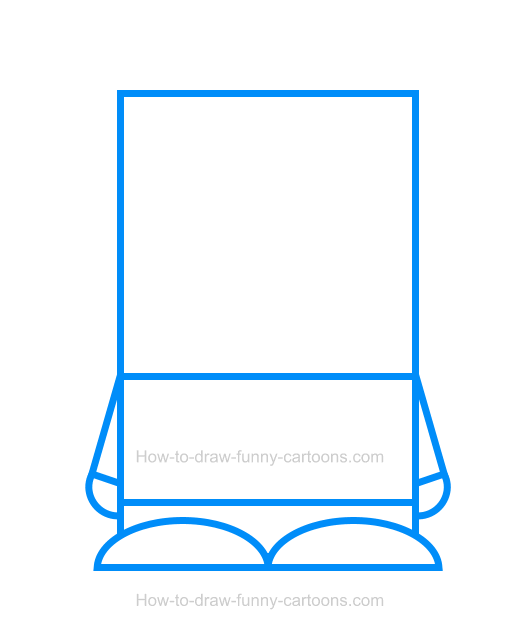 Then, draw as smaller rectangle below to form the body of the character. Add a third rectangle (much smaller) to represent the legs. When you are finished, draw the arms and the hands using small rectangles and circular shapes. The feet are done from straight lines on the bottom and curved ones on top. The face of this cartoon character is quite simple. Start by drawing two large circles to form the eyes. The pupils are made from smaller circular shapes. The mouth is done using long curved lines and the ears are drawn from small circles. No need to draw a nose. That's it for this part of the body. On top of the head, draw a large oval shape with a pointed end to create some hair. Complete the hair by drawing two curved lines on both sides of the head. Above the mouth, draw a moustache using two curved lines. 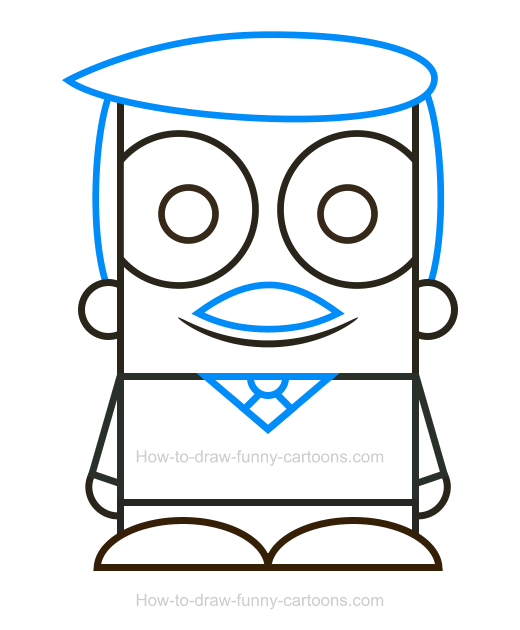 Finally, complete this step by adding a tie inside a small triangle on the shirt of the cartoon character. Let's add some colors inside this beautiful teacher! The hair, the moustache, the pupils and the shoes are all brown. The shirt is green, but the arms are filled with a darker version of this green color (to create some depth). The clothing below the shirt is white and the tie is red. Finally, another green color is used for the pants of the cartoon man. Cool! This teacher clipart is ready to work!